What do you do when your kitchen counters are being overtaken with cucumbers? You make cucumber salad! This recipe is very quick and easy and is a creamy salad. 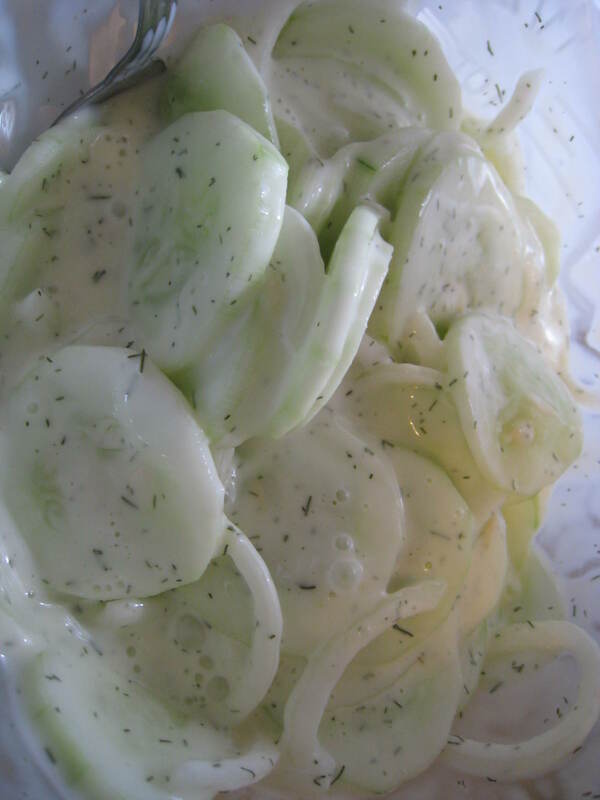 Growing up, my mom would always buy cucumber salad from a local supermarket and I haven’t been able to find a recipe that was close to that – until now! This is so good and I can’t wait to let it sit in the fridge for a day to let all the flavors develop. Just made this…but used fresh dill and added a thin sliced tomato. Oh my goodness!!! It's delish! Thanks for the recipe! I just made this salad and it was so good even before I rfriderated it that I was worried none of it would actually make it into the fridge! Our family has a similar version of this salad. We use equal parts water, sugar, and vinegar mixed and then heated for 3 minutes on the stove. Let that cool and then add mayo or Miracle Whip. Then add the cucumbers, onions, and sprinkle with celery seeds. It's excellent!